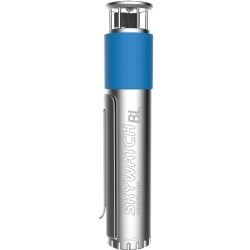 Fixmykite.com Self Stick Valves will stick on all bladders, PU or plastic, clear, orange, or any other color. Simply peel and stick to make a fast easy repair. We offer a large variety of OEM valves for many brands in one-pump and inflate/deflate valves, and can make any valve with a MEGA (oversize) sticky patch. 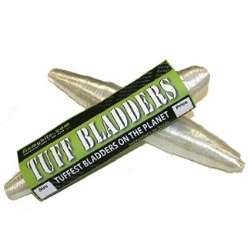 Fixmykite.com TUFF Bladders are different from any other bladder on the market. Over 2 times as durable, these bladders were designed to withstand the abuse of kiteboarding. Made from PU like all factory bladders, these will bend and stretch with your kite without stressing the material. Ripstop nylon Sail tape and Dacron tapes make quick and tough but lightweight kite repairs. Clean area and tape for a temporary fix or stitch on for a permanent fix. 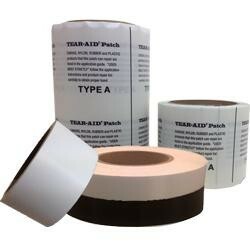 Tear Aid is the #1 Bladder patch material on the market, but can be used for small pinholes and coin sized canopy repairs also. 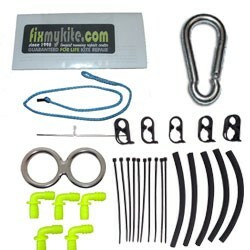 FixMyKite and PKS Accessories provide many little parts and pieces for your repair needs including those hard-to-find pieces like inflate valve caps, one-pump hoses, neoprene clamp covers, and more. Also AquaSeal and KiteFix GluFix. FixMyKite offers a variety of different FixKits, from simple tape and bladder patch kits to full Do-It-Yourself parts kits including parts to help replace or repair bridles, sleeving, sewing work, patching, pulleys, tools, and more. FixMyKite offers different levels of DIY repair kits.